by Kathy Kuhl “If you teach to your children’s learning styles, they’ll learn better,” they told me. But what if you can’t tell how your child learns best? That was my problem. One of the most popular theories of learning styles is based on the idea that people prefer different way (or mode) of learning. People usually prefer to learn either by seeing, hearing, or doing. We call them visual, auditory, or kinesthetic learners. Some add a fourth category, tactile, for hands-on learners. These learning styles are sometimes abbreviated as VAK or VAKT. But the core of the theory is the same: that we learn best when we are taught according to our preferred mode of learning. the discredited but popular left-brained/right-brained learners. The theory that people will learn best when taught in their preferred mode is popular among educators: both schoolteachers and homeschoolers. Most of us have such preferences, and we’ve seen students with preferences. It seems reasonable that teaching people in through preferred mode would help them learn better. However, the theory is not true. All the learning style theories have been discredited by many researchers, studies, and meta-studies. 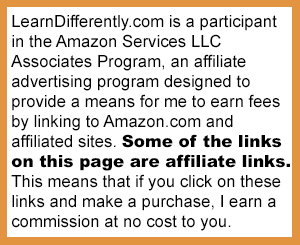 (See links below this post.) Teaching people through their preferred modes doesn’t make them learn better. Dr. Daniel Willingham is a cognitive psychologist and neuroscientist, and professor of psychology at the University of Virginia. He says many psychologists have set up experiments like this. They gather 100 people who identify themselves as visual learners and 100 who identify themselves as auditory learners. The researchers put half the visual learners and half the auditory learners in one room, and the rest in a second room. People in both rooms are given lists of words to learn. Those in the first room get pictures and printed words to study, nothing auditory. Those in the second room only hear the words. Every study shows equal performance, regardless of preference. Both groups learn equally well in either setting. “Auditory learners don’t learn better with auditory; visual learners don’t learn better with visual,” says Dr. Willingham. Or at least everybody believes it! Why? It’s called confirmation bias. Once we believe something, we focus on any evidence that seems to support it. We tend to overlook what contradicts it. Changing our beliefs is hard. The op-ed piece in the resource section below suggests why the theory is so popular among educators despite the data. Most people who prefer visual approaches can still learn auditorily. Most kinesthetic learners can learn visually, and so on. Don’t confuse areas in which people excel with areas in which they can learn. Being a gifted artist, athlete, or musician, doesn’t mean you can only learn by visual, kinesthetic, or auditory means. Ability is not style. A style is how you do something. Differences in ability exist. A person with hearing impairment will struggle to learn by hearing. A student with an auditory processing disorder may, too, depending on the environment and the nature of his or her disorder. But that’s not a preference. It’s still important to customize or differentiate instruction to the needs of the students. As Dr. Willingham explains, most learning is stored in terms of concepts or meaning. In the video linked below, he gives this example. Whether you learned the word opera first by hearing an aria, or seeing a picture of an opera house, you store the word “opera” in terms of meaning. So what’s the best way to teach? First, Dr. Willingham wants us educators not to feel guilty for not adapting every lesson to our students’ preferences. Your children can learn in ways that aren’t their favorites. Second, accommodate needs. I’m not saying to ignore your child’s learning challenges. If your child has difficulty with visual processing or auditory processing, you must adapt. You’ll certainly consider these as you choose, adapt, or write curriculum, and as you teach. Those are not mere preferences; they are needs. Third, match the mode (visual, auditory, or kinesthetic) to the content. I doubt many learn a French accent visually. My French teacher made me listen and repeat. You don’t learn karate or dance by just watching a video or reading a book. You’ve got to move. Fourth, teach using more than one mode. When I “show the steps” (visual) for a math problem, I accompany it with a verbal explanation, obviously. That’s not a multi-sensory approach, though I’ve seen curriculum advertise it that way. It’s common sense. Multisensory teaching is much more. Teaching algebra with beans. Midway through a problem, here I represent the equation 2x = 20. 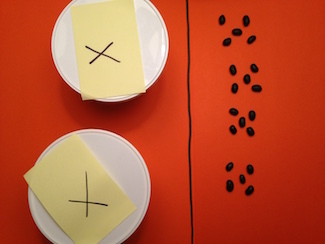 From my blog post on bean algebra. For complex content, you can do more, and sometimes, you should. An appropriate multisensory approach can make concepts and methods clearer. For example, see my blog posts on integer arithmetic or on solving simple equations with beans. Auditory, visual, kinesthetic, tactile, and even olefactory (smell) memories are stored in different parts of the brain. If you read and show your children something and then have them make a model, the meaning is linked to content in different parts of the brain. So a multisensory approach gives the memory more areas to hook to. Consider the difference between a city or mountain you’ve only seen photos of, or only heard someone talk about compared to one you’ve visited and walked around. You recall sights, sounds, movements, tastes, and smells—a much stronger memory. In The Big What Now Book of Learning Styles, Carol Barnier tells how and why to use multimodal approaches. At first, she explains, she didn’t think of teaching musical ditties to help her son remember things. After all, he’s not an auditory learner. Then she accidentally discovered he loved their rhythms. They helped him remember. Like him, your child may like approaches that relate to different styles. 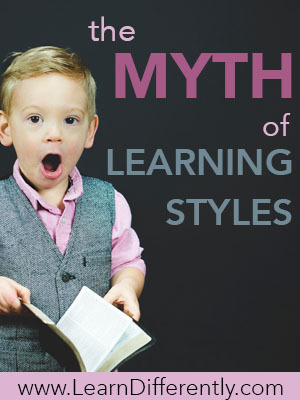 As Tyler Hogan observed in his new book, Demystifying Learning Styles: What Every Homeschool Parent Needs to Know, students may be more motivated to learn when taught in their preferred learning styles. Motivation matters. So go ahead and teaching according to your child’s learning preferences if you choose. But recognize you’re doing it to motivate, and that should improve learning. But you may choose another way to motivate. Tyler Hogan suggests that you use your children’s preferred modes for subjects they find difficult. In their best subjects, you can stretch them by using the modes they need practice in. [To digress, let me recommend Tyler’s short e-book. Going beyond my topic today, this book is more than its title suggests. I might have titled it Educational Theory: What Every Homeschool Parent Needs to Know. But that’s not going to fly off the shelves. In a readable 86 pages, Tyler explains the current understanding of memory, concentration, motivation, and intelligences. He also applies each one to teaching in homeschool and in class. Then the author shows how the current research should affect how we choose curriculum and how we assess our children’s progress. Key points are summarized at the end of each chapter. Your children aren’t always going to get to learn according to their preferred mode. Imagine going into a meeting and asking the boss, “I’m a kinesthetic learner. Could I build a model to help me grasp this company reorganization?” Similarly, if the leaders want to explain policy at a meeting, we usually can’t ask them to send emails instead. One day, our kids are going to need to learn via different modes. That’s another reason not to teach them strictly according to their preferred way of learning. What’s the takeaway on learning styles? Don’t let the myth of learning styles weigh you down with guilt. Match mode or media to the content. Favor multisensory approaches to improve retention. Use their preferred mode for harder subjects when possible. Customize instruction based on your child’s personality, interests, and disabilities—when you can. Recognize that your children won’t always get to learn in in their preferred mode. So give them practice learning in modes they do not prefer. It was a relief for me when our neuropsychologist told me not to worry about figuring out my son’s learning style. My son was dyslexic and distractible. He didn’t seem strong in kinesthetic, auditory or visual styles! That worried me. But he is insightful and creative, with an outstanding memory for story, and great perseverance. We built our homeschool around that love of story—not a learning style in any system I’ve seen. He thrived. What’s your experience with your children’s learning styles? Please leave your comments below. There are many articles debunking learning styles. For this post, I relied heavily on Dr. Daniel T. Willingham, Professor of Psychology, University of Virginia. This first video of Dr. Willingham is also embedded video below. Here’s an 80 second postscript. Other sources include Vanderbilt University. This op-ed piece in the New York Times discusses the prevalence of the theory among educators despite the data. 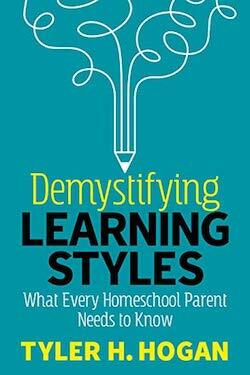 Tyler Hogan’s new book on Kindle, Demystifying Learning Styles: What Every Homeschool Parent Needs to Know. My review of Carol Barnier’s book, The Big WHAT NOW Book of Learning Styles. For more on motivation, see my review of and the first section of Cathy Duffy’s 102 Top Picks for Homeschool Curriculum. There, she discusses her learning categories: Wiggly Willy, Perfect Paula, Competent Carl, and Sociable Sue. Also see my review of Richard Lavoie’s The Motivation Breakthrough: 6 Secrets to Turning On the Tuned-Out Child. Lavoie explains how people are motivated six ways, how to find which motivate your child, and help them. I think of those as learning modalities, and I know that it is harder for me to grasp things when I just hear them, since I am also trying to “visualize” them as we go. So I don’t ignore auditory processing, but I utilize it after I have the visual hooks to hold onto. I have a child who struggles to pass a written exam, but can tell or demonstrate aloud word for word—so we let her show her knowledge aloud as much as practical, while helping her learn written-test skills because she WILL need to be able to pass a written test. Another child made careless error after error, or skipped task after task on a checklist—until asked to read the list or the math problem aloud–she then caught her missteps. Not sure what that’s called, other than learning modality. but we tried not to paint them into a corner–rather used the info to recognize learning strengths and learning challenges. 🙂 Great info–thanks for some interesting food for thought. Thanks, Vicki, for your compliment, and for sharing your insight and experience.